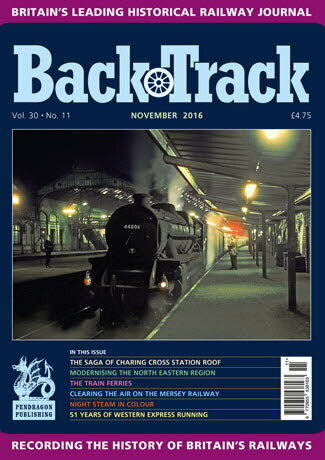 Railway Magazine | BackTrack November 2016 journal from Pendragon Publishing. Colourful Salisbury – Tom Heavyside's photographs from the 1980s/90s. The Saga of Charing Cross Station Roof 1905-6 - Jeffrey Wells describes a serious accident which occurred to the South Eastern & Chatham Railway's London terminus. Modernising the North Eastern Region: Trackwork and Signalling - Alan Taylor notes that the smallest of the British Railways Regions was its most enterprising. 'Let's go Glasgow Electric': Part Two - Geoffrey Skelsey concludes his account of the revolution in Glasgow's local rail transport. The Train Ferries: Part One - R.A.S. Hennessey surveys a specialised form of railway shipping. The Origins, Diagnoses and Historical Prevention of Track Failures: Part One - Michael Binks sets out some of the problems involved in maintaining a safe permanent way. Night Must Fall - Dramatic colour photos by David Rodgers during hours of darkness in the last months of BR steam. To Hull - archive photos of Hull's stations and loco depots. 51 Years of Western Express Running - Performances recorded on the GWR by Charles Rous Marten in 1856 and 1907, presented by David Andrews. Down South - Colour photos of steam at work on the lines of the former Southern Region in the 1960s. Charles Clare 1832-1882 - Mike G. Fell introduces a locomotive superintendent of the North Staffordshire Railway. Tickets of Joint Railways - Geoffrey Skelsey illustrates some rare examples from his collection. Clearing the Air - John C. Hughes offers some thoughts on the Mersey Railway's ventilation problems. Christ's Hospital Station - Jeffrey Wells records a 'white elephant' on the LBSCR. North British Six-Coupled - some 0-6-0s photographed by David Idle. A Lincolnshire Signalman - a local story from A. J. Ludlam.